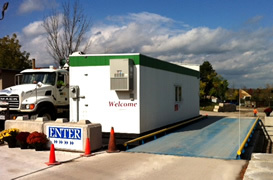 Our facility consists of a 6000 square foot building specifically designed for the efficient handling of residential, commercial and industrial waste. The tipping floor is equipped with an eight foot push wall and a thirteen foot deep loading bay for optimum viewing and load maximization. The landscaped yard, paved driveway and graveled areas for lowering roll-off bins for untarping, are functional and attractive. Two main receiving doors are available with emergency access to another. Waiting times are kept to a minimum by diverting smaller loads to other areas of the yard. Large and small haulers alike have found our facility much more cost effective than driving longer distances to jammed facilities. The forty foot digital scale has a remote indicator seen by the driver to ensure correct weights. 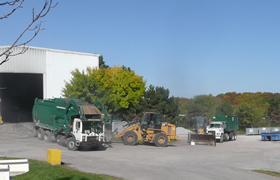 Leferink has been a long standing member of the Ontario Waste Management Association.